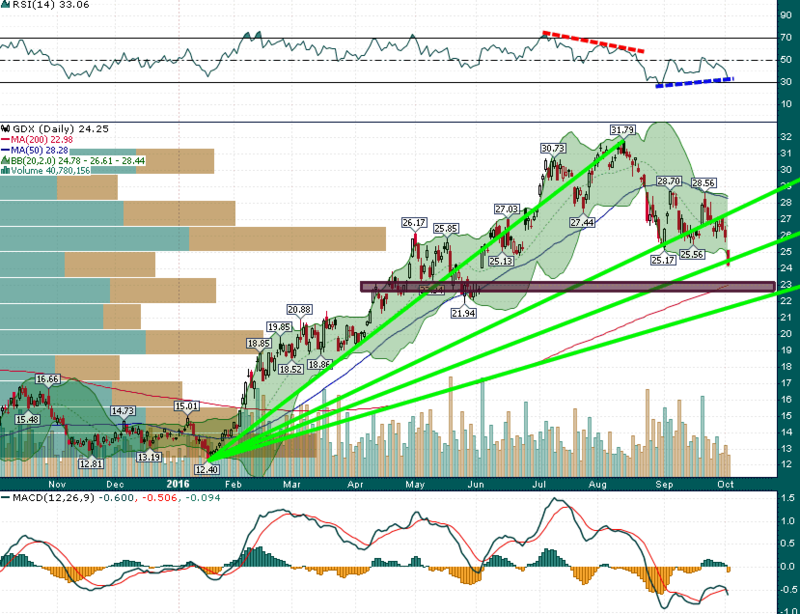 Gold Miners Break Down, Searching For Support | Energy and Gold Ltd.
Gold is down ~$30/oz and the gold miners as represented by the GDX are taking a beating to the tune of nearly 7%. Investors are beginning to ask themselves some important questions such as, where is the next area of support and when will it be time to buy? Given the multi-week consolidation which preceded today’s breakdown it’s unlikely that the sell-off will be limited to one trading session. Major breakdowns such as today typically lead to residual selling in subsequent days until the market is sufficiently oversold that it is due for a bounce. Just as there was a negative momentum divergence at the August high, there is a positive momentum divergence with today’s breakdown to multi-month lows. Previous support/resistance along with the rising 200-day simple moving average near $23 offers an attractive bounce zone from which a 5%+ snapback rally could begin over the next 2-3 days. To find out how @Goldfinger is trading gold and the gold miners in real time you can subscribe to the Trading Lab today! DISCLAIMER: The work included in this article is based on current events, technical charts, and the author’s opinions. It may contain errors, and you shouldn’t make any investment decision based solely on what you read here. This publication contains forward-looking statements, including but not limited to comments regarding predictions and projections. Forward-looking statements address future events and conditions and therefore involve inherent risks and uncertainties. Actual results may differ materially from those currently anticipated in such statements. The views expressed in this publication and on the EnergyandGold website do not necessarily reflect the views of Energy and Gold Publishing LTD, publisher ofEnergyandGold.com. This publication is provided for informational and entertainment purposes only and is not a recommendation to buy or sell any security. Always thoroughly do your own due diligence and talk to a licensed investment adviser prior to making any investment decisions. Junior resource companies can easily lose 100% of their value so read company profiles on www.SEDAR.comfor important risk disclosures. It’s your money and your responsibility.